I ran a few tests on the camera and I tested exposures from 1 to 30 seconds under manual and bulb settings. Luckily, there is no difference between manual and bulb with regards to the setting of the black point -- as far as can be seen in EXIF. The data shows uniform behavior (this is not the case with the newer camera). 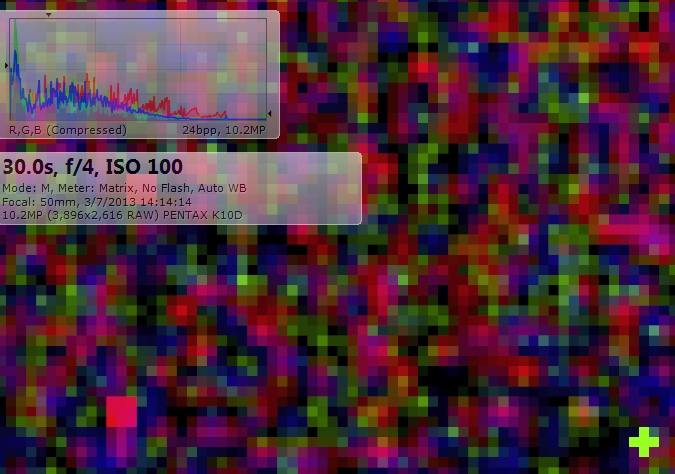 What can be seen is that on the K10D, there is some truncating of the histogram. This is a screenshot from Fastpictureviewer as it gives the raw conversion (rather than the embedded jpg view). I believe that what FPV does when it converts the raw is a scaling function. 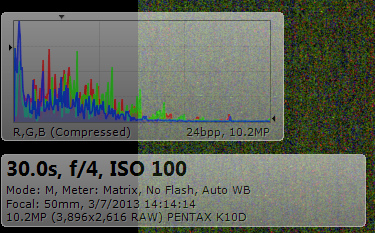 What this does allow is a local histogram view. The 3x3 area around the mouse pointer is averaged and this histogram is displayed. Thus, it can be seen that there is a bit of a bell curve visible with a large spike at the lowest range. Is this truncated? I don't know. Look at the density of the bias noise in the background. This is at a zoomed-out view, not 100%. This above view is 300%. Note the hot pixels that show up as big blocks of color. The overall density of noise in the background is heartening, though. It shows that there are few truly black pixels. Maybe the data isn't truncated? A followup question should be posted to FPV to find out what are the dcraw settings used to do this conversion.